The NBA, really, features more great plays than any other sport. They’re fun, and, after all, it is a game and games are entertainment. But there are different kinds of great plays. Some are, “Hey, look at me,” great plays,” fabulously acrobatic dunks that leave you gasping in amazement at the sheer individual ability and splendor. And some are, “Hey, look at us,” great plays, perhaps a bit clumsy looking at first, not exactly something you can’t do, though doubt you ever would do, not quite graceful but cunningly effective. Like Joakim Noah’s extraordinary save of a Marco Belinelli miss that led to Belinelli’s winning layup in the 85-82 comeback win over the Detroit Pistons Wednesday. It may have been the most unique play a center ever has made. Not offensively, as it couldn’t compare with Wilt’s magic, and not defensively, exactly, as it didn’t rank with the regular wizardry of Bill Russell. 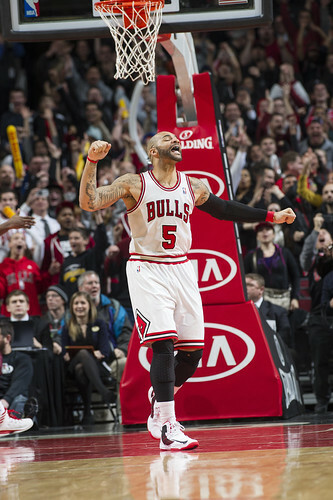 But just for team effort, determination and exceptional timing, for sacrifice for the whole, a unique characteristic that symbolizes this 25-16 Bulls team at the halfway point of the NBA season. So was Jimmy Butler, starting for the injured Luol Deng for a third straight game and leading the Bulls with 18 points, equaling his career high along with nine rebounds and four assists, also tying career highs. 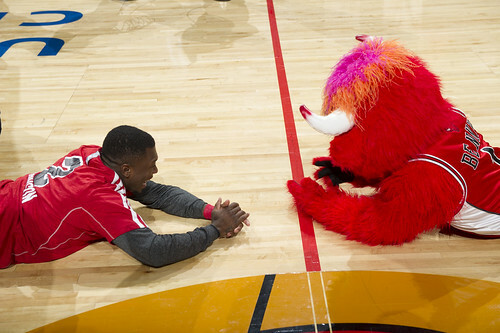 Butler played just over 46 minutes, his average with Deng out, also averaging 15.3 points and 8.3 rebounds. 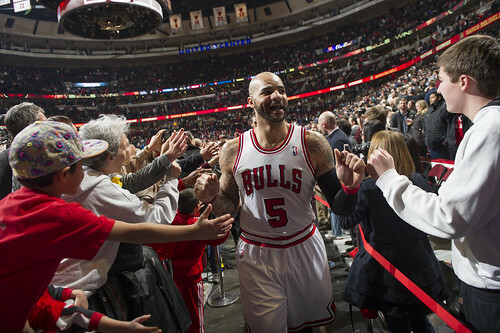 Carlos Boozer had 16 points in just 26 minutes, and Taj Gibson came off the bench with 14. 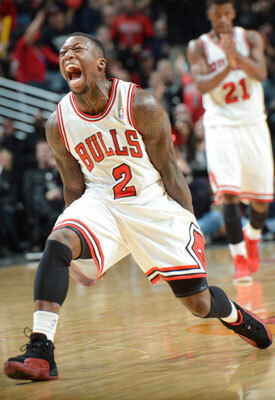 But it was Nate Robinson rescuing the Bulls with Kirk Hinrich scoreless, playing the entire fourth quarter and leading the Bulls in scoring in the fourth, though it was Robinson’s eclectic run with all of his nine points in the first three minutes of the quarter, rallying the Bulls back from a 17-point third quarter deficit. 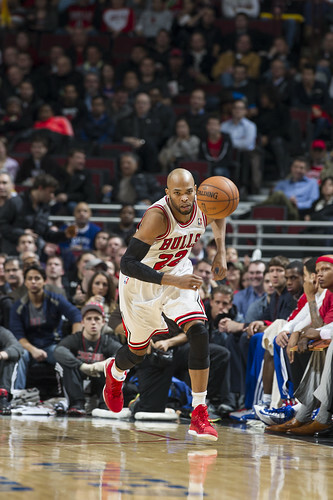 “My biggest asset to the game is energy,” said Robinson, who had a jumper, a pair of free throws, a transition three and assists on two big plays, a fast break pass that Butler threw down with a two handed power dunk just before Robinson’s nine-spot and a baseline bounce pass for a Noah slam to bookend it and give the Bulls a tie at 71 with 7:53 left. It’s much debated as Robinson clearly feels that way whether he’s making the shots or not. 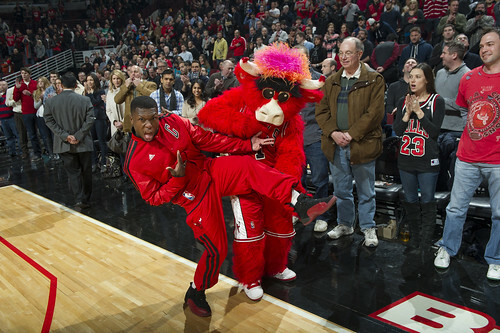 But the Bulls needed him Wednesday, and Robinson responded, also following through like an NFL lineman after a sack with a variety of dances and exhortations toward the crowd. 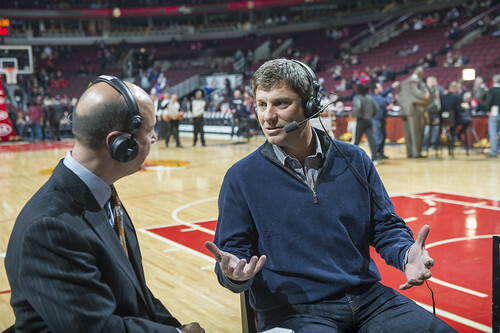 It did get the United Center fans into what had mostly been a bungling game for the Bulls in which they trailed throughout and by double digits most of the third quarter. They really hadn’t done much all game as the Bulls were behind 23-14 to open the game. Noah was late on most of his passes with three first quarter turnovers and Butler’s shots looked more like Frank Thomas line drives. The Pistons were dominating the interior, and their bench came in during the second quarter and pushed the Bulls around pretty good in taking a 47-38 halftime lead and holding the Bulls to 36 percent shooting. And while Butler couldn’t hit a shot, his hustle and effort were commendable in getting loose balls and making plays. 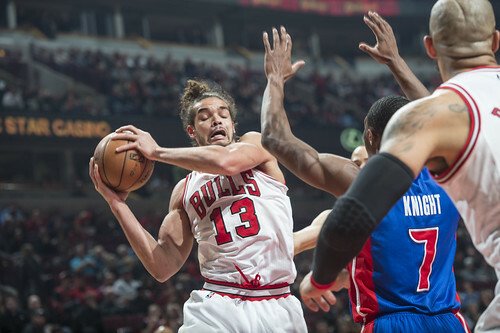 Still, the Pistons, winners of nine of their last 13, persevered as the Bulls couldn’t quite measure their big men inside. 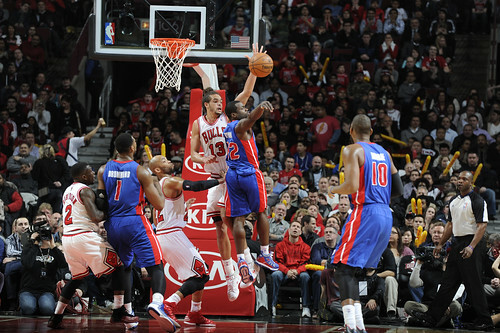 It still was 68-57 Detroit, trying to break a 16-game losing streak to the Bulls, entering the fourth quarter. It seemed a game the Bulls never had a chance to land on the winning side. But that’s when Robinson began seeing mermaids, fairies and pirates dressed as Pistons and continued his refusal to grow up. See, that’s the problem. Though this time he wasn’t lost. 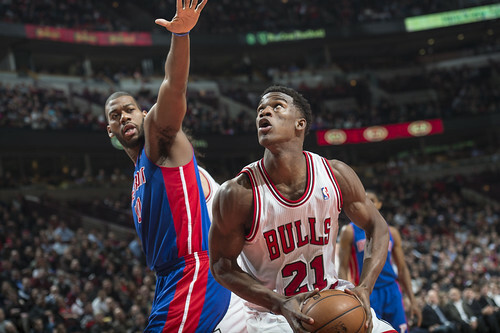 The Bulls then took over against the stunned Pistons running up a 79-73 lead with 4:22 left on a Butler 17 footer. Once again, in part dogged by a tendency to shoot his early shots more on a line and starting one of eight, Butler again came up with some big fourth quarter makes, including a three on a pass from Robinson to get the lead back for the Bulls after a 7-0 Pistons run when it seemed like they’d give up for sure. 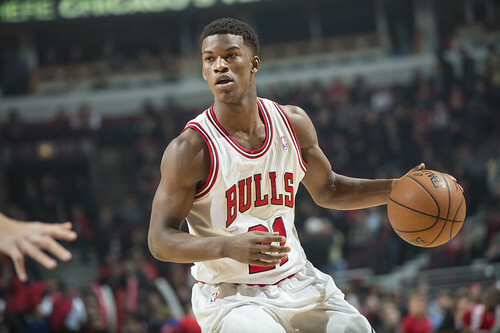 Butler’s three was with 1:51 left for an 82-80 Bulls lead, though the dramatics still were to come. 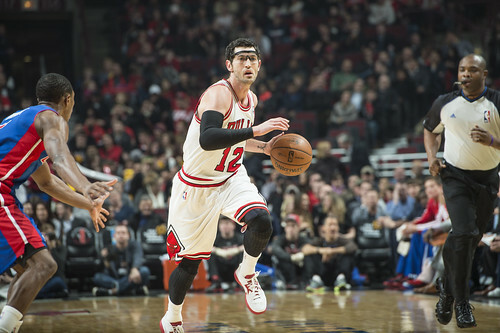 Hinrich ran Rodney Stuckey into a missed three and got the rebound. Butler then drove and missed, but Noah tipped the ball out and it was grabbed by Hinrich. The Bulls were now playing a two man game with Robinson at the point and putting Monroe or rookie Andre Drummond in the pick and roll. The Bulls would take advantage of this, which is a Pistons’ weakness. There’s been much positive talk about Drummond, and I’ve agreed seeing how athletic and graceful he looks. But the Bulls took deft advantage of his defensive weaknesses as they kept putting him in the pick and roll with Noah coming out to set the screen. While there has been much optimism in Detroit about playing he and Monroe together, neither really has much shooting range and their spacing seems a problem and was crowding the court late for the Pistons, leaving them shooting more jumpers. Drummond tends to lay back in pick and roll defense, and when Monroe was on Noah, Monroe has a tendency to try to blitz the play but is late in recovering. Brandon Knight led the 16-26 Pistons with 13. But Monroe, who has been their best talent, was held to nine points as Noah kept him from going to the basket aggressively on offense. Thursday the NBA announces the reserves for the All-Star team and it would be a shocking oversight of Noah were omitted. Mostly, really, and the writers for Sports Illustrated magazine, in what doesn’t even get you a small plaque, voted Noah the defensive player of the year for the first half of the NBA season. But someone buy Noah a trophy or at least a framed print of The Play. It’s Pistons ball trailing 82-80, and they take advantage of Gibson coming to help Hinrich with Jason Maxiell slipping in behind for a layup to tie the game at 82 with 29.4 seconds remaining. It was a nice reaction, but Thibodeau has a lot of plays. And he came up with a beauty even if it didn’t work initially. The Bulls had basically gone all fourth quarter to save the game with Robinson, Butler, Gibson, Belinelli and Noah, the latter playing 45 minutes. But once again Thibodeau, who gets criticized for riding his starters, stayed deep into the bench late in the game. With Robinson running the offense, Butler inbounded and Robinson moved to the right to run down the clock with Boozer coming up to the right elbow to set a screen. 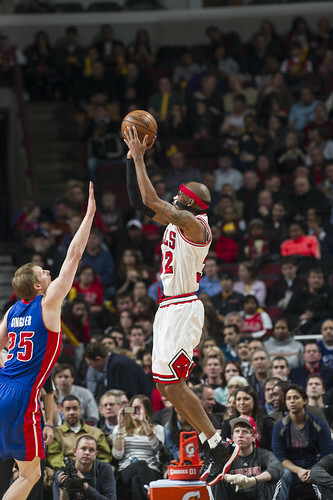 It was a bit early as the Bulls wanted to potentially limit the Pistons’ time if the Bulls didn’t score. Or when they did. 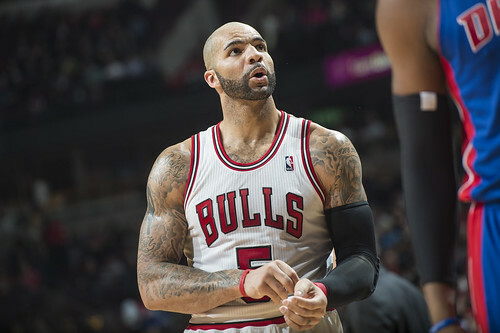 Boozer retreated, but then came back up and screened Knight. Robinson peeled back to his left as the difference between the Bulls’ play and so many other teams’, and why the Bulls have more success despite seemingly limited player resources, is the movement and the opposite side action. Basketball is not hard, but it’s also not about the individual. You see many former NBA players who become coaches, though not all as guys like Phil Jackson and Scott Skiles are great examples, who depend on the strong side play employing the talent of the players. Perhaps because he didn’t have much talent, or at least not enough to be a pro player, but coaches like Thibodeau who had to study the game tend to emphasize moving the defense, having plays run side to side so the defense has to adjust, so it’s more difficult to help and opens the court for driving lanes and for, well, plays like Noah made assuming you have someone like Noah to make the play. As Robinson went back left, Noah came up from the box on the lower left side of the lane where you might post up. 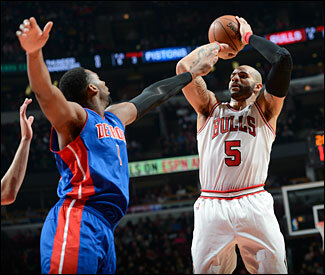 Boozer took out Knight, giving Robinson room to come left. As Robinson was doing that and the defense was reacting to the ball, Noah came up from the left to put a strong back pick on Stuckey. That freed Belinelli, who wasn’t much involved and hadn’t taken a fourth quarter shot yet, for a wide open shot in the left corner. The shot clearly was short from the start, hitting the side of the rim and bouncing along the left baseline. Noah had been going to the boards, but the shot scooted left beyond his grasp along the baseline. Monroe had come to contest Belinelli, but stopped in the corner as Belinelli spaced to the right. Knight had the ball in front of him as it was going out of bounds. Knight looked like he could have grabbed it, but he went to the baseline and tried to seal Noah away from the ball. Noah reached over Knight’s head, stretching out like a seven footer would dive into a pool and end up with a belly flop, grabbing the ball and directed it back onto the court. 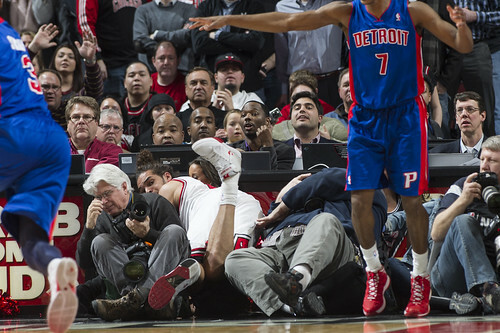 Noah slid into the courtside photographers and Bulls dancers. Belinelli is a clever and active player and as he faded to find open space to shoot again, he saw Noah knock the ball back and ran toward it. He reached it before a stunned Stuckey and Monroe got to it. Stuckey grabbed Belinelli for a foul, and Belinelli finished with a layup and score. 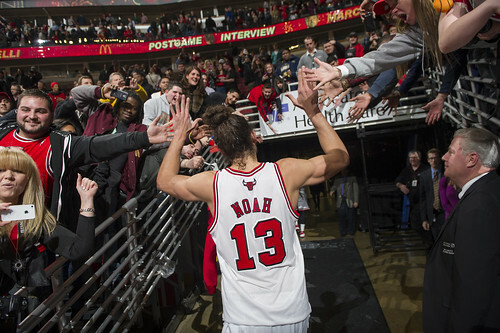 Noah sat among the onlookers holding his palms upward as his teammates celebrated. 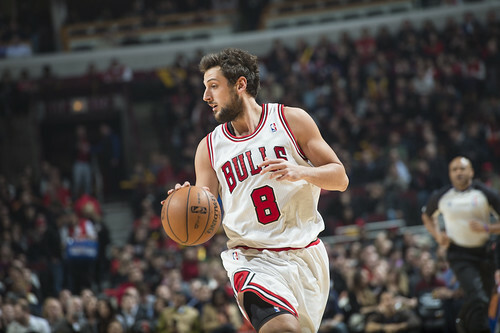 Belinelli would make the free throw for an 85-82 lead with 7.5 seconds left. Maybe it wasn’t quite the Beatles saying love would save the world, but it certainly was a basketball play to love. Though, typically, Noah preferred to spread the love around. “Nate was huge for us,” Noah said. 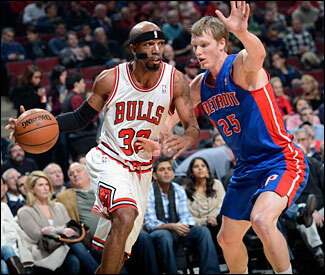 “We needed some energy and he really brought it, Taj as well defensively was huge. Jimmy Butler was huge again. Another great team effort, down 17 at home. We’re not giving the crowd too much to cheer about. Everything was kind of dead. Nate came in and brought the fire. The Pistons would still get two good looks at threes to tie, though both missed. 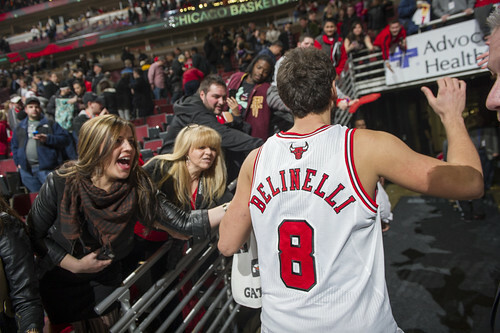 Actually, Noah did see the play as he was looking up and pumping his fists as Belinelli finished. But Jo being Jo he seemed to enjoy those extra few moments sitting among the bonnies. Because Jo’s play was a thing of beauty.